01:00 A HEARTY SHALOM TO ALL OF YOU. 01:02 JEFFERY SEIF HERE WITH MY FRIEND SANDRA LEVITT. 01:15 RIGHT BEFORE WE GET READY TO GO TO THE PARCHMENTS. 01:17 JEFF WE HAVE BEEN EVERYWHERE. 01:21 WE'VE BEEN EVERYWHERE TRAVELING. 01:22 AS HAS PAUL, RIGHT IN THE FOOTSTEPS OF PAUL. 01:30 OF THE JESUS MESSAGE IN THAT FIRST CENTURY WORLD, WASN'T HE? >>ABSOLUTELY. 01:33 AND ENCOURAGING AND I THINK FEISTY IS WHAT YOU LIKE TO CALL HIM? 01:38 YOU LIKE TO CALL HIM A FEISTY GUY. 01:39 WE HAVE AN OPPORTUNITY TO LOOK AT THIS FEISTY APOSTLE. 01:49 WHERE MANY MINISTERS ARE CONSTRUED AS BEST WHEN THEY'RE NICE AND SHEEPISH AND COMPLIANT. 01:55 WE'VE ALREADY SEEN PAUL AS SOMETHING OF A RABBLE ROUSER. 02:04 I WANT US TO GET A NEW VIEW OF THIS ANCIENT JEW. 02:20 I THINK SO TOO, BUT I ALSO THINK HE WAS CONCERNED ABOUT HIS PEOPLE. 02:26 I THINK HE GAVE US PEARLS OF WISDOM. 02:30 HOW TO SERVE GOD. 02:31 HE GAVE US THOSE INSTRUCTIONS ALSO. 02:34 SO YOU SEE HIM MORE FEISTY, I SEE HIM AS MORE, NOT TAKING ANY PRISONERS IF YOU WANT. 02:40 BUT I SEE HIM AS ALSO GIVING US INSTRUCTIONS. 02:42 YEAH I DON'T LOOK AT IT AS CONTRADICTORY PERSONALLY. 02:46 AND IF EVERYONE DOES PLEASE OPEN UP YOUR BIBLES. 02:50 BUT OPEN UP YOUR BIBLES. 03:03 YOU EVER HEARD THE EXPRESSION, "STIRRING IT UP"? 03:05 WELL HERE YOU HAVE IT, PAUL WAS A RIOT MAKER. 03:16 THAT THE LIONS SHARE OF THE NEW TESTAMENT IS CONCERNED WITH HIS TEACHINGS. 03:20 BUT HE WAS A STIR IT UP KIND OF GUY, AND WHY WAS THAT? 03:24 LOOK WITH ME PLEASE IN 2ND CORINTHIANS, CHAPTER 13. 03:29 I WANNA LOOK AT THE NATURE OF THE PERSON. 03:31 AND I WANNA GIVE SOMETHING OF A PROPHETIC CHALLENGE HERE. 03:38 IS JUST WAY TOO NICE AND SHEEPISH. 03:41 WE NEED TO CONFRONT PEOPLE. 03:43 WE NEED TO CONFRONT ISSUES. 03:45 WE NEED DON'T NEED TO DUMB ANYTHING DOWN. 03:47 IF THEY THROW ME OUT OF A CHURCH AS A GUEST SPEAKER, THEY THROW ME OUT. 03:50 IF THEY THROW ME OFF OF TELEVISION, THEY THROW ME OUT. 03:58 AND WE NEED TO BE A STIR IT UP KIND OF PERSON. 04:12 WHERE'S WARNING IN THE CHURCH TODAY? 04:17 THERE'D BE LESS HELL IN THE PEW." 04:18 WELL YOU AND I'VE TALKED ABOUT THIS. 04:24 REALLY WHAT THE PROBLEMS ARE. 04:32 WELL PAUL IS HERE WARNING PEOPLE, HE'S IN YOUR FACE, HE'S TELLING THEM. 04:42 YOU NEED TO KNOW THAT THERE'S CONSEQUENCES FOR YOUR ACTIONS. 04:45 AND IF OTHERS ARE AFRAID TO ROLL UP THEIR SLEEVES AND TELL YOU, I DON'T WANNA BE GUILTY OF THAT. 04:51 AND IT IS LOVING YOU, TO CONFRONT YOU WITH THE REALITY OF YOUR BAD LIFE CHOICES. 04:57 YOU'RE RUINING YOUR LIFE, YOU'RE HURTING THE LIVES OF PEOPLE AROUND YOU. 05:05 IT'LL HAVE CONSEQUENCES FOR YOUR AFTERLIFE. 05:15 SAYING, "THAT'S RIGHT REVEREND, I KNOW I'M A SINNER." 05:29 DO YOU PAST THE TEST? 05:34 NOT LIKELY A GUY LIKE THIS. 05:37 ARE YOU REALLY A CHRISTIAN? 05:38 ARE YOU THE REAL MCCOY? 05:40 TODAY I'D LIKE TO SEE THE AUTHENTIC ARTICLE IN A WORLD OF FRAUDS. 05:43 PAUL CONFRONTS PEOPLE TO EXAMINE, DOESN'T HE? 05:46 HE DOES, BUT DOESN'T HE CAUSE US TO THINK ABOUT IT? 05:49 WE ARE IN A TIME WHERE IT'S FOR ALL THE MARBLES. 05:56 BUT YET WE GET THE FRUIT THAT'S HERE. 06:06 THERE'S A WRONG, THERE IS A HEAVEN, THERE IS A HELL. 06:08 THERE ARE CONSEQUENCES TO WHAT WE DO. 06:12 AND THE LIFE WE LIVE IS A TESTAMENT TO THAT. 06:18 THAT'S WHAT'S ENCOURAGING WITH ALL. 06:19 I THINK THAT'S A GREAT POINT. 06:21 THE WORD "ENCOURAGING" BY THE WAY MEANS TO INFUSE COURAGE, TO BRING COURAGE IN. 06:25 PAUL WILL ENCOURAGE PEOPLE TO HELP THEM TO LIVE RIGHT AND TO ACT RIGHT. 06:31 AND IN THIS SERIES WE HAVE. 06:40 THAT'S AVAILABLE TO YOU IF YOU WANT TO READ MORE ON IT. 06:46 THERE'S A MAN ON A MISSION WHO'S CONFRONTING PEOPLE, TELLING PEOPLE TO GET RIGHT WITH GOD. 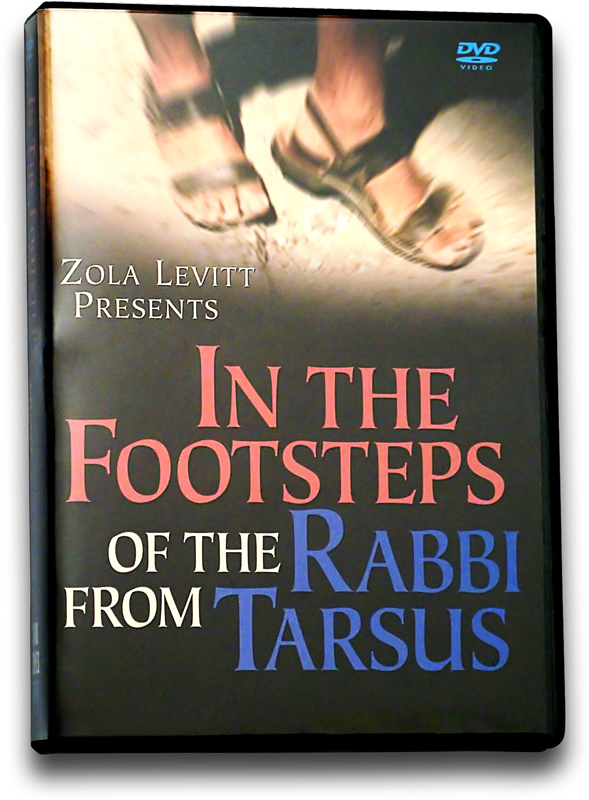 06:51 THIS IS THE RABBI FROM TARSUS. 07:01 AND PUNISH WHEN I COME. 07:08 IS PART OF THE REPERTOIRE OF CHRISTIAN PREACHING AND TEACHING. 07:11 AND WE DON'T HEAR ENOUGH OF IT, BECAUSE PEOPLE ARE AFRAID. 07:19 THEY'RE AFRAID TO OFFEND YOU, BECAUSE THEY NEED YOUR MONEY AND YOUR PARTICIPATION. 07:27 BUT AT THE END OF THE DAY WHAT I NEED MORE THAN THAT IS TO BE FAITHFUL TO THE CALLING. 07:37 HE GOT INTO THE TRENCHES AND CHALLENGED PEOPLE TO LIVE RIGHT AND ACT RIGHT. 07:42 AND ON THE HILLS OF THAT LET ME ENCOURAGE YOU PLEASE TO DO LIKEWISE. 07:47 IF WITHIN THE SOUND OF MY VOICE YOU KNOW YOURSELF NOT TO BE LIVING RIGHT, FIX IT. 07:52 IF YOU'RE INVOLVED IN THE CHURCH, BUT YOU'RE PLAYING GAMES ABOUT IT, CHANGE IT. 07:56 I BELIEVE IN REPENTANCE, I BELIEVE THAT GOD LOVES YOU AND HAS A GREAT PLAN FOR YOUR LIFE. 08:06 ASK FOR OUR FREE MONTHLY NEWSLETTER, "THE LEVITT LETTER." 08:10 WHEN YOU CALL, BE SURE TO ALSO ASK FOR OUR FREE CATALOGUE WITH LATEST VIDEOS, BOOKS, AND MUSIC. 08:20 READING PACKETS, TEACHING CDs, AND MAIL IN TESTS. 08:27 OR CRUISE THE MEDITERRANEAN, VISITING GREECE AND EPHESUS. 08:30 PLEASE CONTACT US FOR MORE INFORMATION. 08:37 ONE COUNTRY TO EXPLORE." 08:40 JEFF WE'RE EXPLORING GREECE. 08:44 I WANT EVERYONE TO COME SEE IT. 08:45 WELL YOU HEARD WHAT THE LADY SAID. 08:47 COME TO CORINTH AND WALK IN PAUL'S FOOTSTEPS. 08:50 IT'S A GOOD EXPERIENCE, ISN'T IT? 08:51 IT WOULD BE OUR PLEASURE TO SHOW YOU GREECE. 08:53 ALL THE BIBLE SITES COME ALIVE WHEN YOU SEE THEM IN PERSON. 08:58 JEFF THEY COME ALIVE. 08:59 I'M SO EXCITED TO SHOW PEOPLE GREECE AND ISRAEL. 09:03 YES, YOU'LL LOVE IT. 09:04 IT'LL BE INFORMATIONAL, INSPIRATIONAL. 09:10 AND WALK IN THE BIBLE LANDS. 09:15 GREECE IN ALL IT'S WONDERS. 09:19 ATHENS, THE ISLANDS, THE GROUPS, THE FOOD JEFF IS WONDERFUL, THE PEOPLE ARE TERRIFIC. 09:22 MAKES THE BIBLE COME ALIVE. 09:24 I LOVE GOING TO GREECE. 09:28 I LOVED SEEING ALL THAT. 09:36 AND TO BRING PERSPECTIVE ON IT? 09:38 PEOPLE, IT'S A TRIP OF A LIFETIME FOR PEOPLE, ISN'T IT? 09:52 I KNOW THAT GOD. 09:55 THAT IT'S A JEW ON MARS HILL. >>THAT'S RIGHT. 09:58 IT'S AN ORTHODOX RABBI WHO CAME TO FAITH. 10:13 IF YOU WANNA TAKE A TOUR TO ISRAEL WITH US, FINE. 10:21 TO SEE THE BIBLE THROUGH THE EYES OF THE JEW. 10:25 WE WANNA REFRACT IT THROUGH A JEWISH PRISM. 10:30 THAT HAS BIBLICAL COMMENTARY AND WORLD EVENTS. 10:32 THERE ARE NUMBER OF WAYS THATWE LOOK TO CONNECT WITH INDIVIDUALS. 10:39 IF YOU MIGHT FIND WHOLE NEW VISTAS OF INSIGHT AVAILABLE TO YOU. 10:43 WELL WE CAN DO A WHOLE THING ON WONDERS, BUT ALSO THE LEVITT LETTER IS FREE. 10:47 WE DON'T CHARGE FOR IT. 10:48 WE WANT PEOPLE TO READ THE BIBLE. 10:51 WE WANT TO TEACH THEM ABOUT THEIR JEWISH ROOTS. 10:53 THE BIBLE IS WRITTEN BY JEWS. 10:55 THIS IS FOR US, IT'S FOR US TO UNDERSTAND OUR JEWISH ROOTS. 10:59 AND THIS IS THE MINISTRY. 11:04 "BRETHREN MY HEARTS DESIRE IS FOR ISRAEL TO KNOW." 11:07 SO, WE'RE RIGHT HERE. 11:10 WE'RE TEACHING THE WORD OF GOD AND IT'S JUST WONDERFUL. 11:13 YES AND IT'S ALL MADE POSSIBLE BECAUSE FRIENDS THINK IT'S WONDERFUL TOO. 11:17 WONDERFUL THERE WE GO. 11:19 YOU KNOW AS I UNDERSTAND IT WE WANNA HELP JEWISH PEOPLE COME TO KNOW JESUS. 11:22 WE WANNA HELP JESUS PEOPLE COME TO KNOW THE JEWS. 11:33 TO BRING PROPHETIC INSIGHTS TO BEAR ON THORNY SOCIAL PROBLEMS IN THE WORLD TODAY. 11:44 AND SPEAKING IN CHURCHES AND WHAT HAVE YOU. 11:45 WELL AND LOOK AT PAUL. 11:46 LOOK WHAT ALL HE DID. 11:47 LOOK HOW MUCH HE TRAVELED. 11:51 MY GOODNESS COULD WE DO ANY LESS? 11:57 THAT PAUL WAS SOMETHING OF A FEISTY SORT? 12:06 IF YOU WANNA CALL IT FEISTINESS. 12:08 I LIKE HIS BOLDNESS AND FOR ME THAT'S THE ENCOURAGEMENT FOR ME. 12:11 WE ALWAYS SAY, WE ARE SAVED. 12:14 WHAT ARE WE SAVED FROM? 12:15 WHAT ARE WE SAVED TOO? 12:20 YOU'RE GOING TO HADES, YOU'RE GOTTA BE SAVED, YOU GOTTA BE SAVED. 12:25 WHAT ARE WE SAVED FOR? 12:31 HIS WORSHIP, HIS RIGHTEOUSNESS. 12:33 WE'RE SAVED FOR SOMETHING AND THAT'S IMPORTANT TO ME. 12:36 DO YOU THINK A LOT OF PEOPLE NEED A JOB? 12:39 WHAT KIND OF JOB? 12:42 AND THEY'RE HAVING TROUBLE MAKING MONEY. 12:43 AND THAT MIGHT BE SOMEONE WITHIN THE SOUND OF MY VOICE RIGHT NOW. 12:46 THAT CAN AFFECT THE HEAD. 12:47 PEOPLE GET DISORIENTED ON A PROTRACTED PERIOD OF TIME. 13:03 MUCH AS THEY CAN BECOME DISORIENTED IF THEY'RE UNEMPLOYED? 13:05 BUT I THINK GOD USES US EVERYWHERE. 13:09 OR ONE WITH MINISTRY. 13:14 AND THAT'S WHAT WE'RE SUPPOSE TO DO. 13:16 OH AND I DON'T MEAN, BY THE WAY, SOMEONE TO GET A JOB AS A PASTOR >>RIGHT. 13:21 BUT SHOULDN'T WE ALL FIND SOME WAY TO PLUG-IN? 13:24 WE SHOULD START EVERYDAY READING THE BIBLE. 13:26 WE SHOULD START EVERYDAY PRAYING. 13:28 WE SHOULD PRAY EVERYDAY, ALL DAY LONG TO OUR SAVIOR. 13:35 AND THEN SAW AN AD IN THE PAPER,"WANTED, ADVOCATE,"
13:37 BUT HE JUST STARTED TO FOLLOW THE HEART. 13:45 AND INVEST IN ADVANCING THE KINGDOM OF GOD. 13:50 GOD WILL TAKE CARE OF TOMORROW. 13:53 WE LOOK TODAY WHAT GOD WANTS IN OUR LIVES TODAY. 13:55 IT'S THE OLD ONE STEP AT A TIME. 14:02 WE ENCOUNTER A GUY THAT WAS WILLING TO ENGAGE AND CHALLENGE. 14:09 THAT THEY HAVE A LOVED ONE WHO'S LIVING IN SIN? 14:16 THAT PROPHETIC WORD IS DELIVERED TO THOSE PEOPLE? 14:22 "I'LL PRAY FOR YOU." 14:27 "I'LL PRAY FOR YOU." 14:31 DR. SEIF WOULD YOU PLEASE PRAY FOR ME? 14:40 BUT WOULD YOU PRAY FOR ME? 14:42 AND THAT'S THE EASIEST WAY FOR US TO WITNESS. 14:44 RIGHT, THAT'S VERY GRACIOUS. 14:45 YESHUA, JESUS SAID, I'LL PAY FOR YOU. 14:48 AND BY THAT I MEAN, THAT SOME OF YOU HAVE A DEBT THAT YOU CAN'T REPAY. 14:55 BUT WHAT PEOPLE NEED TO KNOW IS THAT THE PRICE HAS BEEN PAID IN FULL. 15:00 AND I THINK A FRESH AND FORCEFUL CONFRONTATION WITH THE REALITY THAT YOU'RE LIVING IN SIN. 15:08 AND YOU NEED TO MAKE THAT RIGHT. 15:18 WHO WALK NOT AFTER THE FLESH, BUT AFTER THE SPIRIT. 15:24 HAVE MADE ME FREE FROM THE LAW OF SIN AND DEATH." 15:29 IF YOU DECLARE IT, REAL SIMPLE. 15:37 THAT THERE'S AN OFFER ON THE TABLE IF YOU TAKE IT. 15:45 BUT THIS IS THE WORD OF GOD HERE AND THAT WORD IS COMING TO YOU. 15:53 THAT THE OPPORTUNITY OF A LIFETIME HAS TO BE SEIZED WITHIN THE LIFETIME OF THE OPPORTUNITY. 16:02 WHY NOT DO IT NOW? 16:08 BUT YOU'VE GOT TO PICK YOURSELF UP AND GET YOURSELF IN CHRIST JESUS. 16:13 YOU PICK YOURSELF UP AND YOU GO TO YOUR KNEES. 16:17 WE MAKE IT SO HARD WHEN GOD JUST WANTS US WITH HIM AND THAT'S THE MESSAGE I WANT EVERYONE TO KNOW. 16:22 IT IS NOT HARD, YOU COME TO KNOW THE MESSIAH. 16:25 WE ARE GONNA LOOK SOME MORE AT THE TOUR, SOME MORE OF GREECE. 16:28 WE'RE GONNA LISTEN TO SOME OF ZOLA'S MUSIC. 16:30 I THINK YOU'LL LIKE THIS. 18:26 I LOVE LISTENING TO ZOLA'S MUSIC. 18:28 IT IS SO INSPIRATIONAL. 18:30 I LOVE SEEING THE CRUISES, I LOVE SEEING GREECE, IT'S JUST ALL WONDERFUL, JEFF. 18:34 I CAN'T SAY ENOUGH ABOUT GREECE OR ISRAEL. 18:37 I THINK EVERYBODY NEEDS TO COME WITH US. 18:41 WHAT ARE PEOPLE SAYING FOR THE MOMENT? 18:43 LET'S LOOK AT SOME VIEWER MAIL. 18:45 WE DO GET LETTERS AND FOR THAT WE ARE GRATEFUL. 18:47 THANK YOU FOR WRITING US. 18:49 THIS IS, YOU'LL LIKE THIS ONE. 19:05 MUST BE FROM TEXAS, YALL. >>MUST BE, YALL. 19:07 I MEAN AND SHE GOT YALL. 19:08 I LOVE IT, I LOVE IT. 19:24 AND THEY ASKED ME ABOUT THE SITUATION IN ISRAEL, IN JERUSALEM. 19:29 WHAT IS GOING ON WITH HAR HOMA? 19:33 IS WITHIN THE BOUNDARIES OF THE CITY OF JERUSALEM. 19:36 IT SHOULD NEVER BE A CONTENTION. 19:38 BUT IT IS SOMETHING THAT THE ARABS HAVE ALWAYS RAISED A FLAG ABOUT. 19:43 THEY THINK THAT THAT IS THEIR LAND, IT'S NOT AND ON WE GO, ON WE GO. 19:51 NOW WE WANNA CARVE UP JERUSALEM LIKE A TURKEY. 19:54 SOMEHOW THERE'S PEACE IF WE GIVE AWAY PIECES OF JEWISH EARTH. 19:58 YOU HAVE A PROBLEM WITH THAT? 19:59 I HAVE A REAL, YOU KNOW I HAVE A PROBLEM WITH THAT. 20:02 WE'VE NOT SEEN PEACE. 20:04 HAVE WE SEEN PEACE AT ALL? 20:05 NO, WE HAVE NOT. 20:06 AND THEN I GET THE NEXT QUESTION IS, WHAT ABOUT JERUSALEM? 20:10 ARE THEY GOING TO GIVE AWAY JERUSALEM? 20:11 ARE THEY GONNA CARVE IT UP TOO? 20:16 AND SMALLER AND SMALLER. 20:20 AND THEY'VE GOT 9,000 SQUARE MILES NOW. 20:22 THIS IS NOT RIGHT. 20:24 IT REALLY IS A TRAGIC STORY. >>IT IS. 20:31 THAT WANTS TO SHAVE THE JEWS, TO PRESS THE JEWS. 20:40 SOMEHOW THE JEWS ARE THE PROBLEM. 20:43 AND SOMEHOW PUTTING THOSE JEWS IN THE PLACE, THAT'S THE ANSWER. 20:49 I DON'T AGREE WITH THAT PERSONALLY. 20:51 I DON'T THINK IT'S JUST THE JEWS. 20:59 THAT REALLY WANTS CONQUER THE WORLD. 21:02 THAT EVERLASTING BATTLE OF GOOD AND EVIL. 21:04 WELL LET'S TALK ABOUT SPIRITS. 21:06 THE BIBLE SAYS, "WE DON'T WRESTLE AGAINST FLESH AND BLOOD." 21:11 THE CHURCH LIKEWISE IS ASSAULTED. 21:19 TO KEEP CHRISTIAN FAITH AND VIRTUE OUT OF THE MARKETPLACE. 21:22 WE WANNA BE SECULAR AND NOT RELIGIOUS. 21:28 AND IT SEEMS TO BE RETREATING TOO MUCH SHEEPISHLY. 21:31 WELL, NOT ONLY ASSAULTED, BUT MADE FUN OF. 21:33 SEE SO IF YOU LAUGH AT SOMETHING THEN PEOPLE SAY, YOU KNOW, MAYBE THEY REALLY ARE KINDA CRAZY. 21:39 SEE YOU LAUGH ENOUGH AND MAKE FUN OF PEOPLE, THEN WE'RE NOT TAKEN SERIOUSLY. 21:43 AND IT REALLY DOES ANGER ME IN SOME WAYS. 21:49 EVANGELICAL CHRISTIANS ARE PUSHED BACK. 21:52 WHAT'S ON THE RISE ON THE CURRENT SCHEME OF THINGS? 21:55 I THINK THERE'S TROUBLE COMING, I REALLY DO. 22:00 THAT YOU FIND TROUBLING. >>AND THEY'VE STATED IT. 22:04 THEY'RE NOT HIDING IT FORM ANYBODY. 22:06 THEY'RE AGENDA IS; BELIEVE, DIE, GET OUT OF OUR WAY. 22:11 IT'S A REAL EASY AGENDA. 22:19 SAYS THE IRANIAN PRESIDENT. 22:21 IS IT POLITICAL JUST TO DOWN PLAY THE IRANIAN MENIS A THREAT? 22:29 TO DOWN PLAY ANYTHING THAT'S A THREAT. 22:31 I THINK WE HAVE TO BE AWARE OF WHAT'S GOING ON AROUND US. 22:34 THIS GUY COULD BE WRONG, HE COULD BE RIGHT. 22:36 YOU CAN NOT BELIEVE THE LIES. 22:39 YOU CAN'T BELIEVE THE EVIL YOU HEAR, YOU CAN'T. 22:42 YOU HAVE TO BELIEVE WHAT THE BIBLE TELLS YOU. 22:44 YEAH AND THE PROBLEM IS I CAN'T EVEN BELIEVE OUR OWN PRESS ANYMORE THESE DAYS. 22:48 IT SEEMS TO ME THAT THINGS ARE JUST SO INFORMED. 22:56 YOU HAVE A LOVE FOR JEWISH PEOPLE, YOU HAVE A LOVE FOR JESUS. 23:02 IN A WORLD WHERE TRUTH IS IN VERY HIGH DEMAND AND VERY SHORT SUPPLY. 23:12 LET ME ENCOURAGE YOU THAT WE DO HAVE A MAGAZINE THAT SANDRA HAD MENTIONED PREVIOUSLY. 23:16 WE CALL IT THE LEVITT LETTER. 23:18 IT'S ALL ABOUT JEWS IN THE NEWS AND IF IT SPEAKS TO "YOUS" WE WANNA SEND IT TO YAH. 23:22 WE NEED DONATIONS, BUT THEY CAN ALWAYS COME LATER. 23:35 WE'RE NOT ASKING FOR YOUR MONEY RIGHT NOW, WE'RE ASKING FOR YOUR EAR. 23:44 AND YOU'LL HELP US AS THE LORD LEADS YOU. 23:45 BUT WE WANT YOU TO BE INFORMED PERSONALLY ABOUT THE WORLD THAT WE LIVE IN. 23:57 I THINK IT IS WAY TOO MUCH POLITICAL CORRECTNESS. 24:01 PEOPLE HAVE TOLD US FOR YEARS THAT WE SHOULD CHARGE FOR IT. 24:04 THAT WE SHOULD HAVE PEOPLE SUBSCRIBE TO IT, PAY MONEY FOR IT. 24:10 THAT WHAT WE'RE TEACHING AND WHAT WE'RE PREACHING IS CORRECT. 24:20 YOU NEED TO BE AWARE OF IT. 24:23 THAT WE DON'T BELIEVE THIS, THAT WE BELIEVE IN THE ONE GOD? 24:28 LISTEN AND PEOPLE AREN'T AWARE OF THINGS. 24:33 OR GET YANKED OFF OF A TV STATION OR TWO. 24:37 WE HAVE A CANDIDATE, HIS NAME IS OSAMA...? 24:52 YOU KNOW, AND HARRY STONE. 24:55 GIVE ME THAT NAME AGAIN. 24:59 I'M GONNA GET IN TROUBLE FROM THAT. 25:00 THAT SOUNDS A LITTLE ISLAMIC TO ME. 25:02 HE'S GOT SOME ISLAMIC BACKGROUND. 25:06 SO THAT HE LOOK LIKE HE IS MIDSTREAM MIDDLE AMERICA. 25:09 YOU KNOW I'M NO PROPHET IN THIS REGARD. 25:26 THAT'S AN INTERESTING DYNAMIC THERE ISN'T IT? 25:29 IT WILL BE INTERESTING TO SEE WHAT THEY TALK ABOUT. 25:31 IT WILL BE INTERESTING TO SEE WHAT THEY TALK ABOUT. 25:34 WOULD THEY TALK ABOUT POLITICS OR RELIGION? 25:36 HOW WOULD THEY SEE THE WORLD? 25:39 THAT'S WHAT I THINK WILL BE INTERESTING. 25:42 "WHY CAN'T WE ALL JUST GET ALONG?" 25:48 AND WE'RE GONNA STOP TERRORISM AT OUR BORDERS?" 25:55 A YEAR AT LEAST. 25:56 THESE ARE FASCINATING TIMES. 25:57 I WONDER HOW PAUL WOULD WEIGH IN? 26:03 A NEWSPAPER IN THE OTHER. 26:04 AND HE WOULD BE ADDRESSING THE ISSUES OF THE DAY IN A FORTHRIGHT MANNER. 26:12 WELL THERE'S NOTHING NEW UNDER THE SUN. 26:13 KING SOLOMON SAID IT THOUSANDS OF YEARS AGO. 26:16 THERE IS NOTHING NEW UNDER THE SUN. 26:22 HE SAW THE SAME THINGS. 26:25 WE ARE IN EVERYDAY LIFE. 26:27 DID YOU EVER HEAR THE EXPRESSION, "TO LOOSE YOUR HEAD?" 26:29 I WANNA LOOSE MY HEAD. 26:31 YOU KNOW HOW PAUL DIED? 26:32 HE HAD HIS HEAD CUT OFF. 26:36 IS THEY DIDN'T LIKE HIM. 26:38 AND THE REASON WHY THEY DIDN'T LIKE HIM IS BECAUSE HE SPOKE THE TRUTH. 26:45 WHERE TRUTH WAS IN HIGH DEMAND AND SHORT SUPPLY. 26:50 BUT WE HAVE THE TRUTH HERE AND THAT'S, THAT'S WHAT KEEPS GOING. 26:53 STAND UP, PROCLAIM IT, LIVE IT, BE IT. 26:54 ONE MORE LETTER BY THE WAY. 26:56 WE DON'T HAVE A LOT OF TIME. 27:04 THIS IS THE BAPTISMAL SIGHT IN THE JORDAN. 27:10 THANK YOU VERY MUCH. 27:15 AND ASK THAT YOU MAIL IT TO THE FOLLOWING ADDRESS. 27:25 IT'S YOURS FOR THE ASKING. 27:31 HERE'S A STORY: "THE ISLAMIC DELUSION." 27:34 THERE'S ANOTHER STORY: "MORE MIDDLE EAST MADNESS." 27:37 THESE ARE COVER STORIES. 27:38 "THE DOCTRINE OF DEMONS," BY JACK KINSELLA. 27:41 A GOOD FRIEND OF HAL LINDSEY. 27:42 IN OUR LITTLE ONCE CHRISTIAN TOWN OF BETHLEHEM. 27:48 NOW IT'S 12 AND DECLINING FAST.